I haven't done a Cover Love in a while, but this cover grabbed me so much that I had to jump back on the wagon. Also, you know, I'm trying to do that thing where I post stuff. So yeah, it's gorgeous, right? There are a lot of intense, vibrant colors which could risk clashing, but the strong red-oranges holds it together, and the more muted background keeps it from being overwhelming. 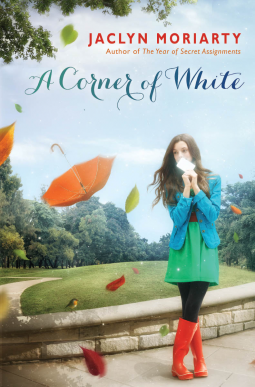 Is it not also clever that a book called A Corner of WHITE is so colorful? Except for that blinding white thing she's holding. I have no idea why it's windy or what's going on, but I have a great feel for what tone and atmosphere I can expect. Doesn't hurt that it sounds like a great read, too. For our music cover, we have an OMGMOSTAMAZINGTHINGEVERWANTTOHUGIT cover of "Comfortably Numb" by Pink Floyd. Well, okay, it breaks the rules a bit because it's actually Roger Waters of Pink Floyd with Eddie Vedder at the Hurricane Sandy benefit concert. So it's like, half a cover. But whatever. Eddie Vedder is one of those people that I didn't like as a child and then all of the sudden, I was a Pearl Jam fanatic. And he kills this song, giving an edge to the dreaminess. Chicago rockers for the win. Happy Birthday CJ!!! may it be a fabulous day for you!